Mark Pettini says Leicestershire's ambition was a major factor in his decision to move from Essex. The batsman has joined Leicestershire, who came bottom of Division Two, after finishing third with Essex this year. "The biggest thing was the ambition to become a successful side again, to get promoted and win trophies," he said. "As a player that's really important, being somewhere where results are a main priority, where you can play a part in achieving something." 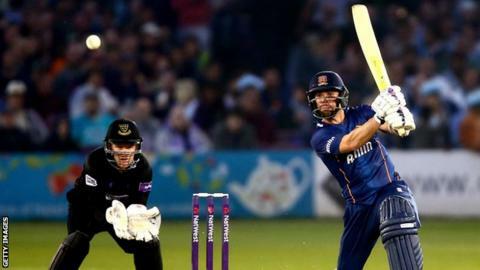 The 32-year-old told BBC Radio Leicester: "That's where they believe they can take the club and also to do it with an exciting brand of cricket." Pettini became the third experienced county pro to sign for the Foxes for 2016, following the recruitment of Middlesex all-rounder Neil Dexter and Lancashire opener Paul Horton. The former Essex captain has scored 7,934 first-class runs at an average of 36.73, including 12 centuries and 46 half-centuries since making his debut in 2001. And he expects his former side will end their seven-year drought without a trophy in the not too distant future. "I was there 14 or 15 years and received huge support the whole time from all the other players, members, coaching staff and supporters. "I was sorry to leave it behind, it will always hold a special place in my heart, no doubt. But for me, at the age of 32, what Leicestershire were offering me, it was the right decision for myself and my cricket," he said. "Essex have a very talented squad, they're a close-knit group and want success. They've probably fallen a bit short in not putting a trophy in the cabinet but I do believe that will change and I wish them well."